Acton Youth Club is ran from Acton Resource Centre on a Wednesday at 6.30pm – 8.45pm. The club is desiged for 8-13 years olds from any of the wards served by Acton Community council. The club is delivered by qualified and experienced youth workers, that hold a current enhanced DBS criminal records check. Acton Youth Club runs a varied and exciting programme of activities full of fun and have weekly generic youth work activities on offer too for the ones that just want to “Chill out”. The club has a tuck shop that is ran by the young people themselves, and the activities on offer and always based around what the club attendees have asked for. 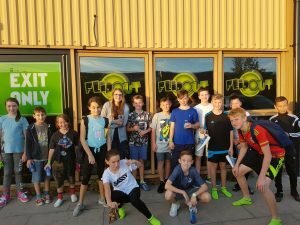 For example, we were recently able to organize a trip for 16 young people to Flip Out in Chester which was a brilliant evening out. Come along and see what its about, and come and Tell Niall, Julie and John what activities you would like to see at the club.